The look of rustic burlap, but without all the negative scratchiness, plus. You will have fun working this napkin into your next picnic or choice western event. 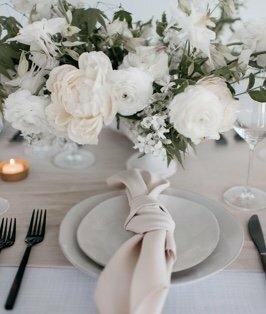 Pair it with one of our lace runners or White Table Linen, and create an updated shabby chic event that will have your guests in awe. Our Sand color is warm and inviting, and an amazing neutral to be the background for any color you design from Red and White to Loden and Saffron…the possibilities are ENDLESS!